A film influenced by the responses of its audience and a graduate who completed his studies despite contracting meningitis were among the Plymouth University winners at the 2014 Media Innovation Awards. Many Worlds, one of many innovative projects devised by composer Dr Alexis Kirke, won the Installation/Exhibition/Event category while Jonathan Brough, who this summer graduated from the BA (Hons) Media Arts programme, was named Student of the Year. There were further successes in the app category for Plymouth company Elixel, set up by graduates of the University’s Digital Art and Technology course, and for 2003 graduate Korash Sanjideh, who was recognised for his outstanding contribution to the creative sector in the South West. 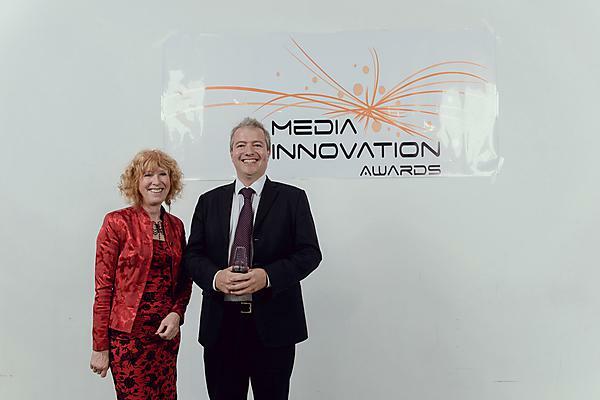 The Media Innovation Awards are designed to recognise creative innovation and talent, with the 12 categories spawning nominations from Dorset, Devon, Gloucestershire, Bath, Cornwall and Bristol. Many Worlds is centred around a bizarre physics experiment, but its plot and soundtrack alter based on the moods and emotions of four members of the audience (who are fitted with tiny sensors measuring their heart rate, muscle tension, brainwave activity and skin conductance). It was one of two projects by Dr Kirke which were shortlisted in the category, the other being a sonification of David Bowie’s career developed in collaboration with Heaven 17 and Human League founder Martyn Ware. Jonathan Brough was 19 and in Canada training to be a ski instructor when he was diagnosed with meningitis, and subsequent complications in his treatment left him paralysed from the neck down. But despite his disability, and the fact he requires round the clock care, he fulfilled his dream of pursuing his studies and in 2014 graduated with a First in Media Arts.